I work from an old desk in a newish apartment near the centre of Rome. I live here with my husband, our young son and our overly exuberant dog. My most recent work is a book about the increasing industrialization of children’s diets and the effect this is having on their health and on traditional food cultures. Of course, I’ve drawn heavily on my experience of raising a child in the great food capital of Rome to write it. 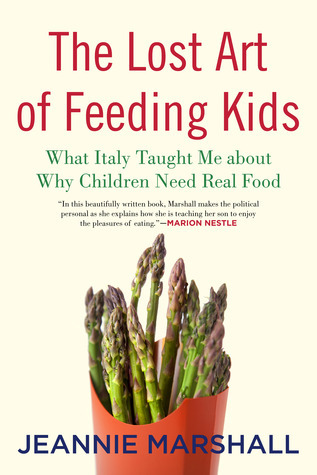 It’s called The Lost Art of Feeding Kids: What Italy Taught Me about Why Children Need Real Food (in Canada it has a different title – Outside the Box: Why Our Children Need Real Food, Not Food Products). I have worked as a freelance journalist in Berlin, Madrid, New York and also my hometown, Toronto. Before moving to Italy, I spent five years as a features writer in the Life section of the Toronto-based National Post. In 2002, I moved to Rome with my husband. It was supposed to be a two-year adventure, but the adventure continues. I’m so glad you’re starting this blog, Jeannie, and I can’t wait to read the book. Congratulations, again! Dear Jeannie, we just wish to let you know that Bambini in Cucina (a non profit organization based in Milan) is now following your interesting work. We’d be glad to like to write about your articles and forthcoming book on fb and our our blog, for the benefit of many English-speaking parents living in Italy. I just wanted to say that I’m almost done reading your book. I’ve been devouring it for the past two days and think it’s a wonderful gift to parents the world over. Thank you for writing it! Thank you! I’m so glad you’re enjoying it. And thanks for telling me, too. J. Your book is wonderful. I have two young children (2 & 4) and I find it a consistent struggle to find “healthy” snack options. I live in Seattle now, which is offering more options then where we used to live. Since starting your book last week I have already seen a change in my kids when I encourage them to eat a vairety of vegetables. I even got my son and daughter to try raw radishes (something I never personally had tried). You are right, children will eat good food when you make it exciting for them to do so. Your book is encouraging me ever more to go unprocessed and cook up great meals at home, even if it takes more time. Keep doing what you are doing and hopefully by the time our children are our age every school will have truly healthy options and no more corporatization.